A stunning modern detached family home located at the end of a private drive sitting in grounds of approximately 3.8 acres. The property has been constructed by the current owners and finished to a very high standard throughout. It is been built in the style of a Georgian Coach House with all of the modern extras you would expect in a house of this quality. The accommodation in the main house is light and airy with large rooms – downstairs you will find a vaulted entrance hall with the grand staircase, a large sitting room, a large modern family kitchen, dining room as well as a further reception room – all rooms benefit from doors to the rear garden and planning permission is in place to further extend the property if required. Upstairs you will find the master bedroom suite with large en-suite and a dressing room, two further large bedrooms, a further en-suite and a family bathroom. Under the house is a further room which was built as a gym and is accessed via the rear terrace. Accommodation The Coach house is just a few years old and has been constructed by the current owners and finished to a very high standard throughout. It has been built in the style of a Georgian Coach House with all of the modern extras you would expect in a house of this quality. The owners have spared no expense in fitting out the property with hand-joinery throughout, especially noticeable on the grand oak staircases with galleried landing and the handmade 'arched coach house' style windows. - The accommodation in the main house has been designed to be light and airy with large bright rooms - downstairs you will find a spacious vaulted entrance hall with the grand staircase, a large sitting room, a large well fitted modern family kitchen dining room as well as a further reception room - all rooms benefit from doors to the rear garden and planning permission is in place to further extend the property if required. Upstairs you will find the master bedroom suite with large en-suite and a dressing room, two further large bedrooms, a further en-suite and a family bathroom. Under the house is a further room which was built as a gym and is accessed via the rear terrace. The property is run from a top of the range ground source heat pump system which provides both heat and hot water and dramatically reduces your utility costs. Outside The triple garage is also newly constructed and has an annexe / studio above with a shower room and wc below. The garage space could easily be converted into further accommodation if required. 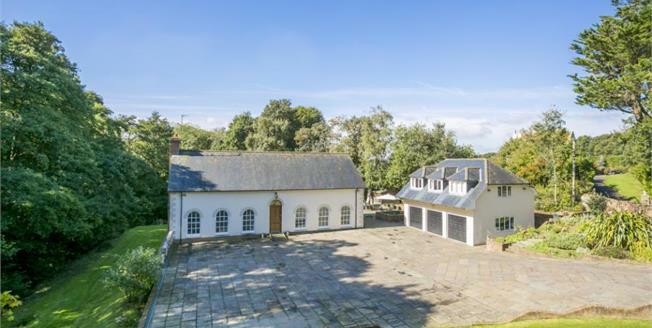 Outside the house sits in grounds of approximately 3.8 acres mostly of lawned areas and light woodland - with a large flat lawn - ideal for children and quirky air raid shelter which is buried in the garden and access via steps down. There is a very large paved parking area in front of the property and triple garage. Internal viewings are highly recommended to appreciate the location and quality of this lovely family home. Location The property is situated in a delightful tucked away position in this rural location yet provides easy access to local facilities. The pretty and historic town of Battle is a short drive away and provides a comprehensive range of shops and restaurants. Cooden (1 mile) and Battle (5 miles) both provide mainline stations with services to London, Gatwick Airport and Brighton. The local area is well served with a wide selection of both private and state schools catering for children of all ages. The surrounding countryside offers delightful walks and access to hacking paths, footpaths through ancient woodland. The coast is a mile away.